Moolin Rouge | CowParade New Figurines | One Price Low Flat Shipping! From the Cow Parade Retired Figurines Collection, Moolin Rouge. Made of hand-painted resin. Medium size measures 4" x 6". Designed by artist, Doina Levintza. Featured at CowParade Bucharest, Romania 2000 exhibit. 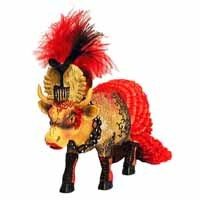 This dramatic cow is dressed up in a red skirt and black lace and is wearing a feathered headdress and is wearing a masquerade type mask around her eyes.